IT’S BEEN called everything, from pervasive computing to “everyware” to the “Internet of Things” (or if you’re speaking to Cisco, the “Internet of Everything”). However, this new industry, which has only become a catchphrase in Malaysia this year (a national blueprint is in the works and should be launched in November), has been long in the works. Basically, the Internet of Things (IoT) takes computing out of the realm of computers (and smartphones) and brings it to, well, everything — your car, your hairdryer, your shoes, your watch, your garbage bins. Everything that can be chipped, will be chipped (including humans). Alessandro Bassi, of Alessandro Bassi Consulting, has worked on IoT since 2004, when he joined Hitachi Europe as a researcher for advanced networking topics, and he considers the IoT revolution to be much bigger than mobile telephony and the Internet put together. In other words, it’s a step towards artificial intelligence. Naturally, this brings up a host of questions about privacy and security. To be always online, linked to a variety of different objects — some known, some unknown — that are quietly recording information and building profiles of us, is unnerving for some. For others, it is merely the next logical step in the evolutionary process, where the convergence of humanity and technology becomes seamless. Malaysia does not seem to be interested in some of the more philosophical debates in the industry, but it sees the potential and wants to be part of the ecosystem. According to research firm Gartner, IoT is expected to generate 35 zettabytes of data and US$2 trillion (RM6.5 trillion) in value globally by 2020. Cisco expects 50 billion devices to be connected to the Internet by then. It makes sense. The country already has the pieces in place, whether it is the Penang Silicon Valley, which has been developing over the last 40-odd years and has moved from manufacturing to design, or even the Multimedia Super Corridor (MSC) initiative from the late 1990s, or lately, Digital Malaysia. While you can spend time debating the relative success or failure of these initiatives, either individually or collectively, there is no denying that they have resulted in plenty of technology-related companies in the country. We have the whole spectrum, from the chip makers to application developers and service providers. Now all that remains is to bring these together in a coherent manner, find out what everyone is doing and try to synchronise the development of products, platforms and technologies. This is where the IoT initiative comes in. It started in April, when Collaborative Research in Engineering, Science & Technology (Crest) organised a workshop in Penang with Gartner. More than 30 companies attended and Gartner ran through the industry perspective and market and technology trends in this relatively new area. In the breakout session after the presentation, the industry shortlisted four key areas, or “verticals” in industry-speak, for Malaysia to focus on — healthcare, transport, smart cities and retail. Germany-based embedded computing company Kontron agreed to be the industry lead for the healthcare cluster. A few months later, Motorola stepped up to be the industry lead for the transport cluster. As there were already a number of companies working to develop technology related to healthcare, this cluster took off first, and Crest agreed to facilitate its development. In subsequent workshops, it mapped out the “quick wins”, as well as medium and long-term goals, for the sector. Crest research and programme director Dr Khoh Soo Beng says a quick win, or short-term goal, is going for what it calls an “integration play”. “IoT is not rocket science. We don’t need earth-shattering technologies. We are looking at the existing technologies and how to integrate them to formulate a solution for areas such as rehabilitation, child growth and development, and elderly care. We have cluster members working on that now and foresee the key solutions being introduced within three to six months,” he adds. The National IoT blueprint is being driven by Mimos, but as Khoh points out, that is more of a national top-down approach whereas Crest’s efforts have more to do with starting where we are, with what we have, and moving from there. A combination of both is necessary if we are to make this a success. Part of the connected healthcare cluster involves bringing in experts to ensure the technology companies are not developing in the dark. There is always a problem when it comes to developing new technology. The geeks often go for the “coolness” factor, which may not have practical applications. For the connected healthcare cluster, experts include medical practitioners, hospitals such as the National Heart Institute (IJN), and the Ministry of Health. This built-in reality check has already seen some results. For instance, when ViTrox Corp Bhd demonstrated its “vision expertise”, which allows a patient’s temperature and heart rate to be measured simply by having a picture taken with an ordinary smartphone, the doctors present asked whether this could be further developed to measure the circumference of a baby’s head. When babies are brought in for check-ups, this is one of the measurements doctors need to take to gauge the development of the infant, and although it is relatively simple to do, babies do not like it. This then would be a practical application of such a technology. ViTrox took the suggestion on board and is now working on it. For the long term, Crest has signed an MoU with the University of Cambridge in the UK to send Malaysians to Cambridge Labs to work on projects. These Malaysians will return equipped with the requisite knowledge to collaborate with local universities and lead the research. One of the projects Crest is especially keen on is wearable technology, a plaster with a radio-frequency identification (RFID) component that can be unobtrusively attached to the skin for monitoring purposes. What are some of the challenges of getting into IoT at the moment? Firstly, for the industry to really take off, the cost of sensors and devices will have to come way down. IoT is after all a way of hooking up the physical world to the Internet in a cost-effective manner. “There is still a lot of work to be done in commodifying the tiny devices with which we instrument the world — the sensors and the actuators,” Ericsson’s Holler says. His next point touches on the second major challenge when it comes to the widespread development and adoption of IoT — standards. “We need to eliminate fragmentation in technologies and protocols, and promote the use of standard IP and web technologies as well as operating systems. We also have to make sure the devices can be used across applications and that the service the individual device is providing is properly [marketed],” he adds. Khoh weighs in. “Right now, there are many IoT standards available and most of today’s IoT solutions are proprietary implementation. For example, one cannot buy a sensor from company A to replace its existing IoT-enabled sensor as the device may not be compatible. “If you don’t have an end-to-end solution, no one is going to buy from you. Therefore we have to define the common architecture. All these standards are not going to be able to interface properly with one another,” he says. Jaffri says Malaysia has all the right components to be a player. Now, all it will take is for the different players to understand the market and how to be a part of it. “We basically want them to understand the kind of game that’s being played in the IoT business. It’s not about trying to do it all themselves but rather, specialising in different areas and collaborating on a solution the market wants. And the market, to me, is not just Malaysia, it’s global,” he adds. And this market throws up opportunities for many different types of companies and not just the device manufacturers. SMEs looking to get in on the game need to define which layer of the market they want to participate in. “According to Gartner, there are five layers in this market: things, communications and networking, computing and storage, applications and services, and analytics. The giant chunk of the pie, which will be worth US$262 billion by 2020, is in the last two layers — applications and services as well as analytics,” says Jaffri. It would be challenging for any SME to go it alone in this space. “The best thing you can do is collaborate with others. Now people are bringing their solutions into clusters. If you want to be part of these IoT clusters, you can contact Crest and we will connect you to the right people,” says Khoh. What are some of the applications already out there? Take cars, for instance. “By 2017, all cars manufactured in the US have to be ‘connected’,” Khoh points out. This has been driven primarily by safety regulations. What does that mean? “Let’s put it this way. In the future, rear-end collision is going to be a barbaric act because considering how connected and smart the cars are, there is no way you can get into that kind of collision except on purpose. And rather than having an app like Waze tell you that there is a traffic jam, this application will tell you to drive at 30km per hour to hit every green light, which makes for more efficient driving,” he explains. The downside (for those who would rather not show up on surveillance equipment) is that you are always detectable. “So from 2017 onwards, those who don’t want to be tracked will be driving vintage cars,” Khoh says. These applications are fairly complex and expensive. But you could go for something pedestrian that serves a need. For instance, if you work late every day and your parents are worried about what time you get home. Rather than pester you with phone calls, they could do something fairly simple, like install a lamp in your home that triggers a lamp in theirs. The moment you turn on yours, theirs goes on, letting them know you have arrived home safely. “So, no matter where you are, as long as you have an Internet connection, you can connect to each other,” says Khoh. Another application, which is even cooler, is one that hooks up to treadmills. “Now you can choose who you want to run with and where you want to run. For instance, say you decide to run in San Francisco. In front of the treadmill, there is a TV screen and it’s live and Internet-enabled. It will have the terrain in San Francisco for you. The treadmill will simulate the gradient and better still, if you have friends who want to run with you, it can link up with all of them via the Internet. But Malaysian companies, for some reason, seem to be hooked on the healthcare side. Take Geob International Sdn Bhd, an SME with strong growth potential, which has developed a hypoband you can wear on your arm. It monitors your sweat and alerts you if you are about to get a hypoglycemic (low blood sugar) attack. Better still, it sends messages to your caretakers or loved ones if you are about to have an incident. 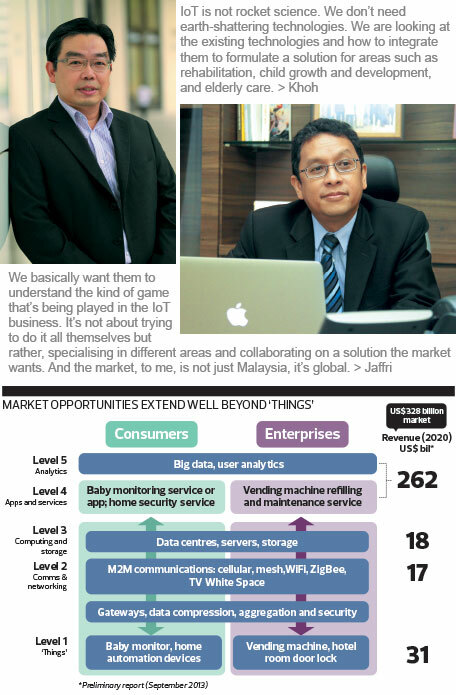 Or Embedded Wireless Labs Sdn Bhd (see cover story), which has come up with a pendant that can be used to monitor wearers remotely. It can also be used by post-surgical patients as a means of monitoring them after they have been discharged or as part of newly independent aged care — to monitor the elderly who would rather live at home than in a senior citizens facility. The company has also come up with a machine that collates data from other monitoring devices, such as a blood pressure sensor or a blood sugar monitor, and saves it in the cloud, from where it can be accessed by physicians or loved ones. IoT is set to be the next big thing. Government resources are being marshalled to take the country forward from a technological and industrial perspective. Companies would do well to re-examine what they are, where their strengths lie and how they can get into the game — as a device manufacturer, technology or service provider, or as a user. It would not do to be left behind.